Wishing you all a wonderful Hanuman Jayanti! Bharat trips are planned around visits to popular temples. Meera too loves temples and has figured out what is required, and promptly removes her sandals on entering. She gazes at the murthy in awe, speaks in hushed tones and respectfully bows. 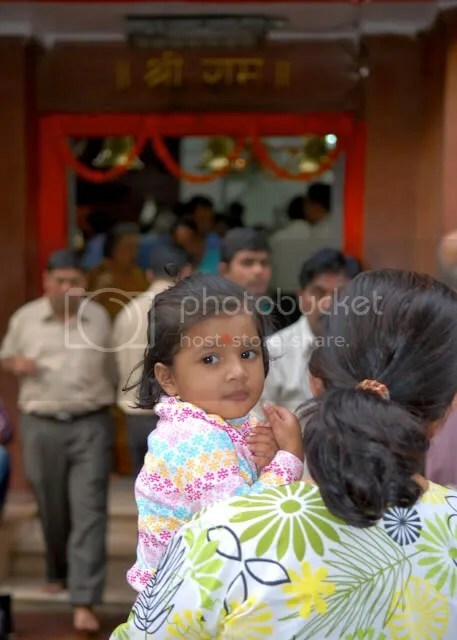 She delightfully receives the aarti, looks forward to prasad and asks me for money to place in the Hundi (donation box). She is fascinated by the different animals and birds carved in relief, painted on murals or on calendars inside, and points to each of them. As she leaves, she even turns back for a last glance. Meera’s fascination with temples makes it easy for us to visit our favorite temples. 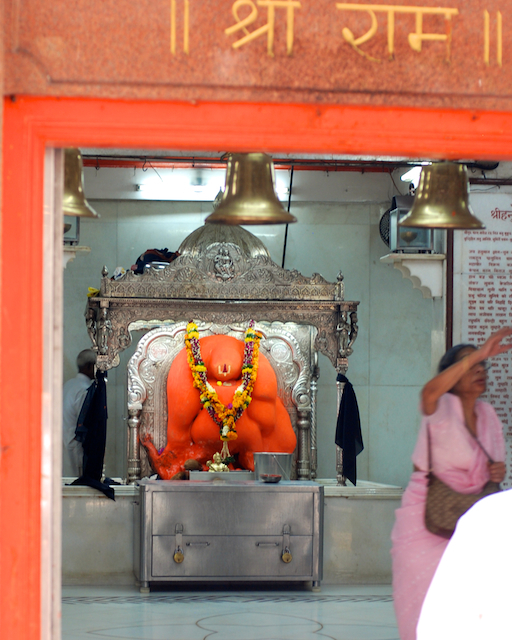 Just a few blocks from our home is a Hanuman (popularly called Maruti) Mandir. We walk there nearly every evening on the way to Gateway of India, or Kailash Parbat for a snack. 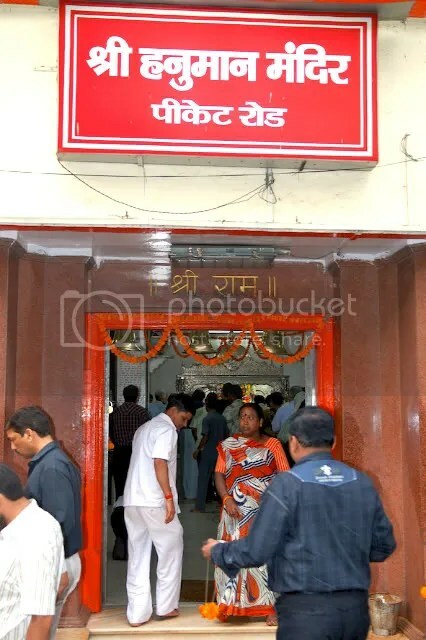 On Saturdays, we often visit the Hanuman Mandir on Picket Rd in Dhobitalao, smack across the Kalbadevi Police Chowki and near Parsi Dairy Farm and Gita Press bookstore. Nestled in a row of shabby buildings, it would be easy to miss, but for the throng of devotees clamoring outside. After depositing your chappals, buy a bowl of sesame oil with a pinch of black udid lentils (black bengal grams) and a simple flower streamer. You should see your reflection in the oil before offering it at the feet of Maruti. The thinking is that the oil snatches your negative wibes and drains them at the feet of Maruti, who detroys them. On a marble altar under a silver mandap (canopy), Maruti is smeared with sindhur (saffron ochre). 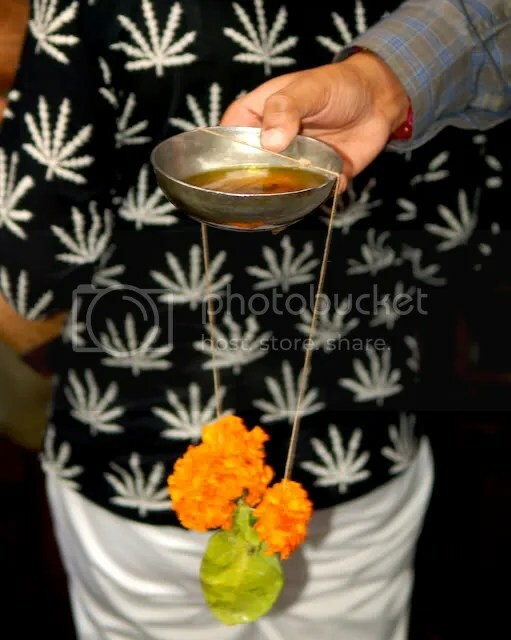 I offer the garland and bowl of oil to the priest, who pours it at Hanuman’s feet. As we start to walk around the murthy, I touch the feet of Hanuman and with my ring finger, get some sindhur and apply it to Meera’s forehead and then mine. M does the same. There is also a shrine to Shani, ruling deity of the planet Saturn. We pray to Shani to rid negative influences in our daily lives. Sadhu outside the temple ready to bless everyone. 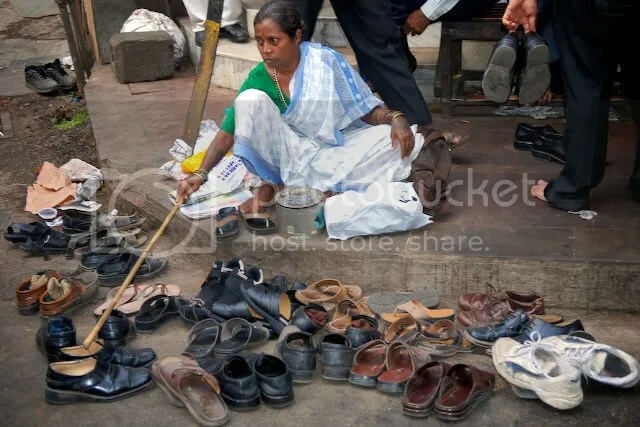 Behen-ji tending chappals outside the temple. Don’t forget to tip her well. Still such a beautiful and engaging place. 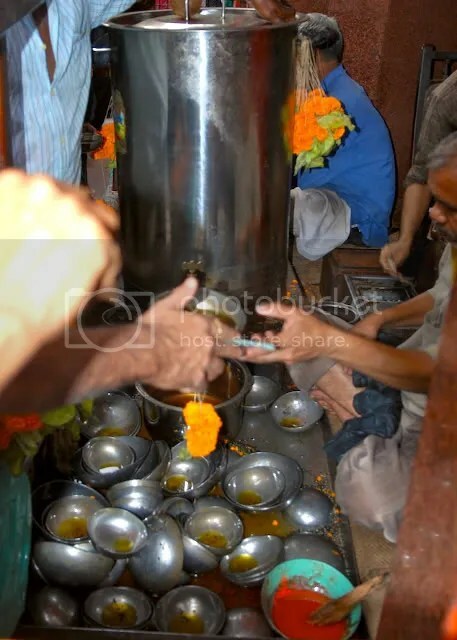 My family does regular sewas at this temple…the waraq (real silver coatings) are till done by my Dad and Uncle and in former years by my Grandpa…. although distance has made me go ocassionally( i myself put at vashi…as we have a branch out there)…but this place holds a bagful of memories from my childhood,teenage and the early adulthood !! Arun… your description with pics … just takes me down memory lane… i had a close friend by the name of Uday Shanbhag in school who is into logistics … any connection ? That is so great to hear. Is the “waraq” done regularly? The next time I am in Mumbai, I would love to take some pics of your family doing that seva. Wishing you the best in your line. And don’t know any Uday. Thank you for sharing your comment here. 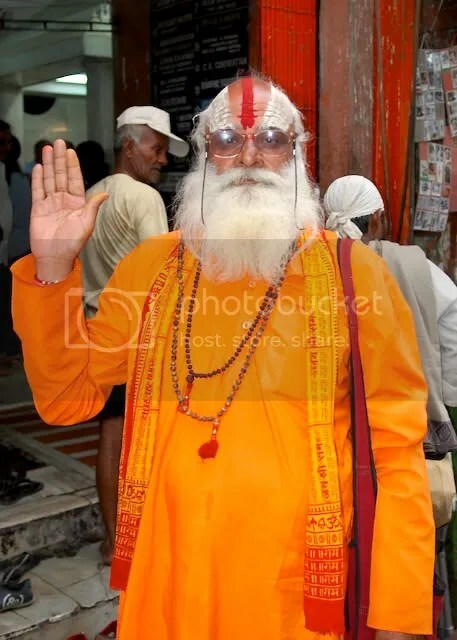 The sadhu outside the temple is vibrancy personified. Nice account. Yeah, He was all dressed up and all and did not mind me taking the pic. I was introduced to this Shree Maruti & Shanideva shrine at PIcket Rd. in the 90s by a close friend and colleague in Mumbai -(- our Head Office is located just near by on VT Marg (LIberty cinema road)) and so convenient to go there . I was deeply taken up with this place and since then made it a point to visit -offer prayers when in Mumbai. along with facilities inc feeding the poor and also Cows. Meaning: Lord Hanuman is the messenger of Lord Rama. His pace is as rapid as the wind and as quick as the mind. Hanuman has constrained his sense organs. He is the most intelligent among the intelligent ones. Hanuman is the son of Vayu (Pawan) and the chief of the monkey tribe. We surrender ourselves to Lord Hanuman. Thank you Captain-ji. That is a beautiful mantra for Hanuman Jayanti. Thank you for sharing that and wishing you and your extended family, Hanuman’s grace.